Only the highest quality and most delicious, Grade A Fancy sweet potatoes carry the Princella name. That’s because inside every can you’ll find only the finest sweet potatoes, packed with nutrients and bursting with flavor. We make meals with all the comforts of home sweet home! 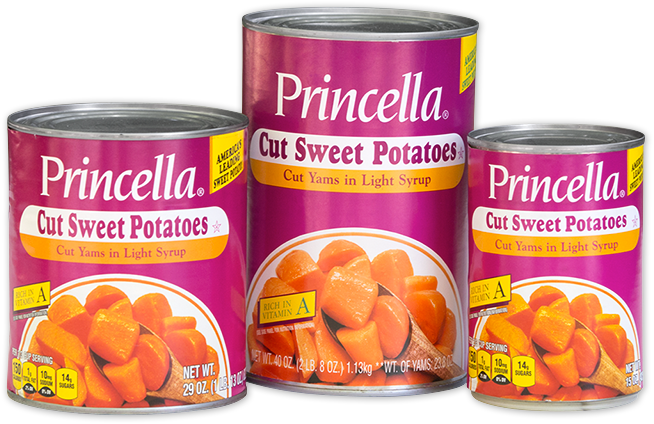 Princella cut sweet potatoes are canned in light syrup and rich in nutrients such as Vitamin A. We offer sweet potatoes in 3 sizes to fit every need: extra large, large and family sizes.